Add this vanity to your bathroom for more traditional style in your home. Its comes with a nice black granite counter and white solid wood base for strength and style. Redo the style of your bathroom with this classic from Avanity. Durability, versatility, beauty. You get all three in this rectangular white quartz top. Classic design, pure lines, and a range of sizes ensure that whatever the style of your cabinet this top can complete your vanity set with elegance. It is paired with Avanity rectangular sink CUM20WT-R to complete the look. Add understated elegance to your bathroom with the Delano Collection. Spare in style, we designed Delano to accent a range of bathroom dicor, blending simple beauty with unmatched versatility. Whether you choose the Taupe Glaze or White Finish, the 30-inch Delano features a durable solid wood frame and sophisticated black bronze pulls, 1 flipped down DWR and 2 functional DWRs. 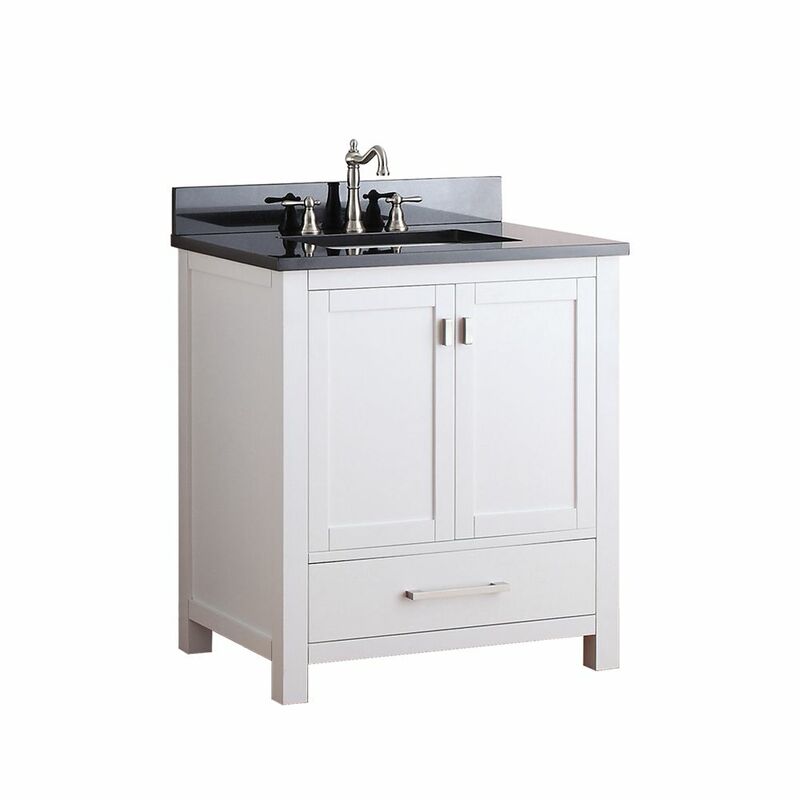 The combo includes a durable galala beige marble top and rectangular white vitreous china sink. The Emma 43 inch vanity combo embraces purity of design and masterful construction. The vanity in White finish paired with black bronze hardware brings to life the cabinet's simple, clean lines. Emma provides abundant storage and Zen-like functionality. Soft-close glides and hinges keep things quiet and the solid wood frame and dovetail joints keep things strong. It includes a black granite top and rectangular undermount sink. The collection also features complementary mirror and linen tower to expand the look. Emma makes your bathroom beautiful. Modero 31-inch W Freestanding Vanity in White With Granite Top in Black Add this vanity to your bathroom for more traditional style in your home. Its comes with a nice black granite counter and white solid wood base for strength and style. Redo the style of your bathroom with this classic from Avanity.